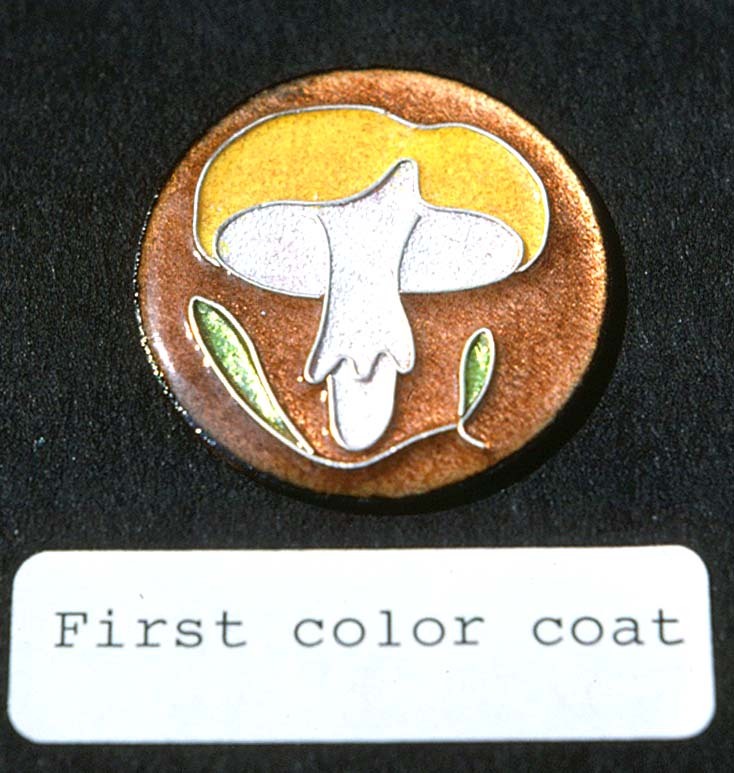 Through most of my working years, I was generally aware of the enameling art and it fascinated me, but I never found time or opportunity to pursue it. The known history of the art dates back about 3,000 years. The art continues to evolve and expand. A well-made enamel artwork, reasonably protected, can endure hundreds of years in good condition. Some have endured thousands. It can be a gift to our descendants. It is exciting to watch a workpiece go through a fiery ordeal, come out glowing hot, and then gradually reveal beautiful designs and gleaming colors as it cools. 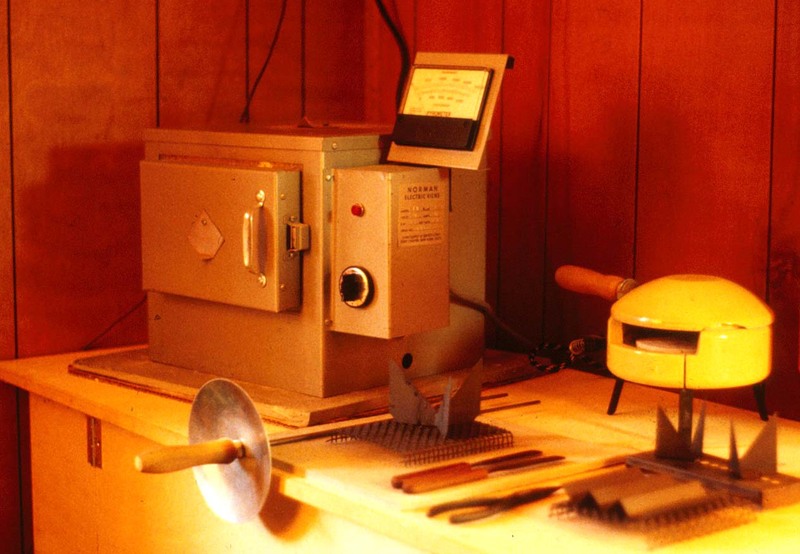 The time to learn about enameling came with retirement in 1983. Opportunities abounded at that time in the Washington, DC metropolitan area. The National Enamelist Guild, a local group of perhaps 100 members, promoted the art with vigor and imagination. With their initiative and support, annual art shows were held; a curriculum of training courses was set up at Glen Echo Park; advanced workshops were arranged to be given by nationally and internationally renowned artists; and the Enamelists Gallery was established at the Torpedo Factory Art Center. At Glen Echo, I had the privilege of studying under some of the leading masters of their art: the enamelists Gwen Anderson (“Orsini”), Tina Chisena, and Dorothea Stover; and also Susan Tamulevich, an artist of diverse fields including wearable art, jewelry, and other art metal specialties. Enamels are special formulations of glass designed for fusing onto other materials at high temperature. 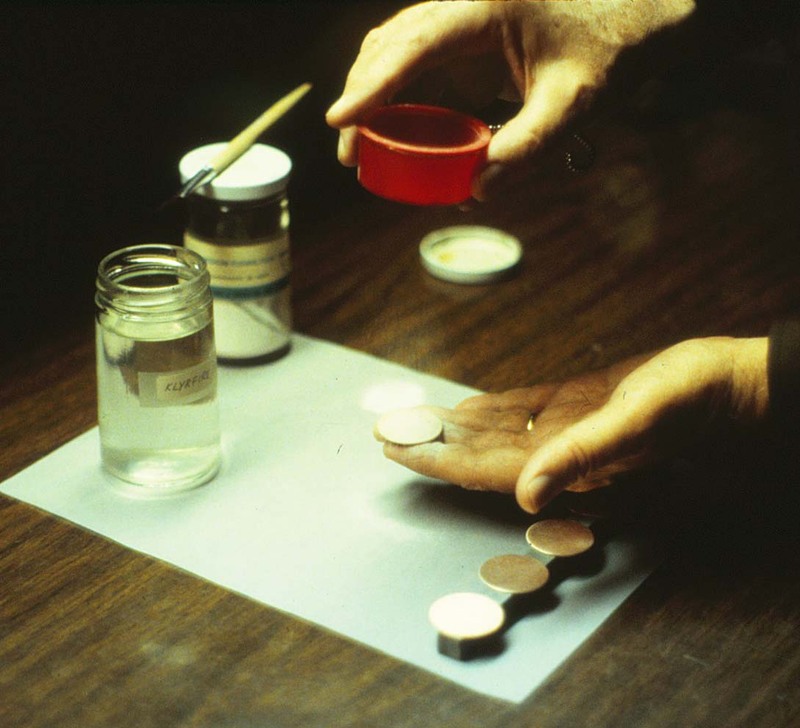 The enamels that I worked with were designed for use on gold, silver, and copper. They could also be used on steel if it had a primer coat of enamel previously applied in an industrial process. They were produced by an American firm (Thompson) and had been in use for about a century. These enamels contained lead, which enhanced their brilliance in a manner like that of leaded crystal glassware. In the late 1980s, the entire line of enamels was reformulated to eliminate lead. Lead poisoning had been a hazard primarily to the enamelist who inhaled the fine dust while preparing a piece for firing. My experience was with only the lead-bearing enamels. 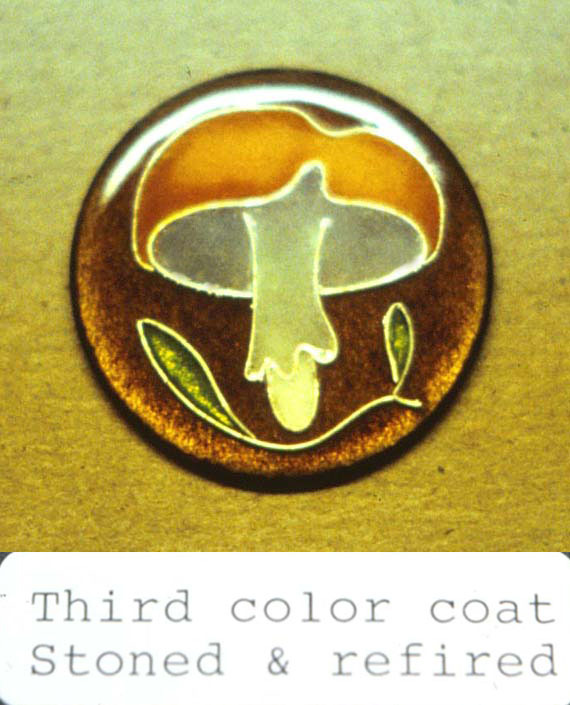 The enamels were made in a wide variety of colors in three major groups: transparent, opaque, and opalescent. They were available in several forms: granules (material resembling fine sand), larger lumps and flakes, and fine threads. In the dish shown here, the granules were sprinkled on to form the background; lumps were added to form the pebble-like light-colored and red areas; and flakes formed the petals of the flowers. 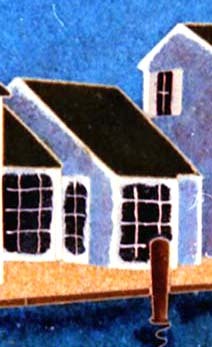 In the enlarged image of a house, white threads were used to form mullions in the windows. 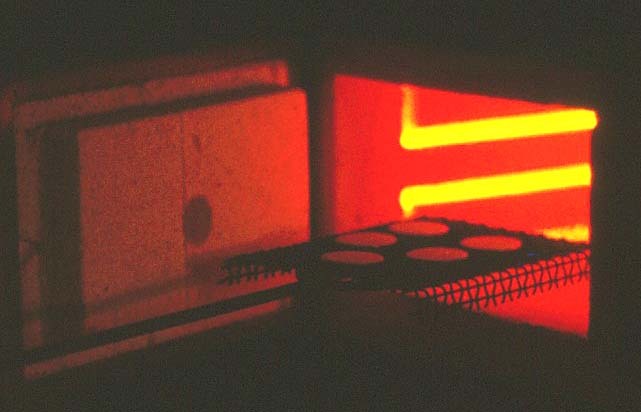 The basic firing equipment includes a kiln, trivets to hold enamel pieces by the edges, and a steel-mesh platform on which the trivets are set. The long fork (with sword-like handle) is inserted beneath the platform to place the assembly into the kiln and to remove it. Various spatulas, tongs, and pliers are used to handle the hot pieces. The box-like kiln (center and left) is the smallest size normally used by professional enamelists. The chamber is 8 inches wide, 4.5 inches high, and 9 inches deep (front to back). The kiln operates on household current (120 volts), whereas larger kilns require 240 volts. Like all enameling kilns, it is front-loaded. Most of the firing is at temperatures of 1,400 to 1,500 degrees Fahrenheit; for some high-firing techniques, the temperature may approach 2,000 degrees. The smaller yellow kiln at right is primarily for use by hobbyists. It can handle only small flat pieces. 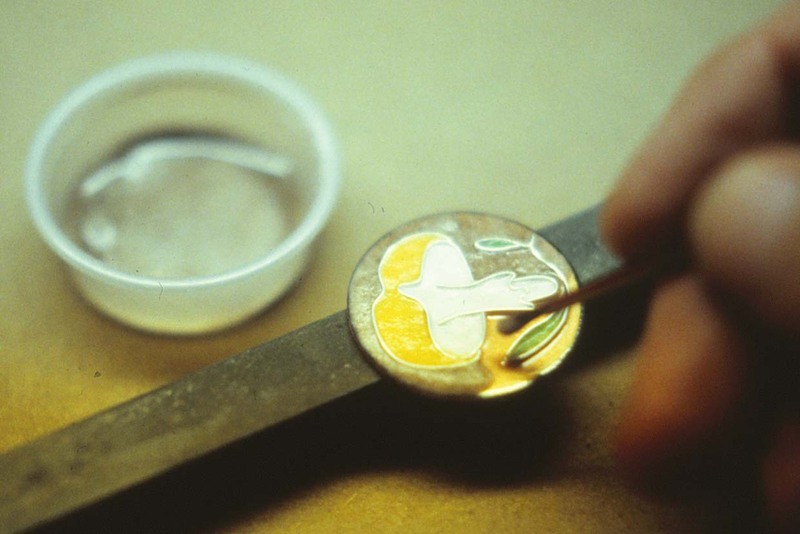 The preparation of a simple cloisonné piece illustrates some basic features of the enameling process. As usual, the process involves several steps, each following by a firing. The result is a layered sequence of enamels. 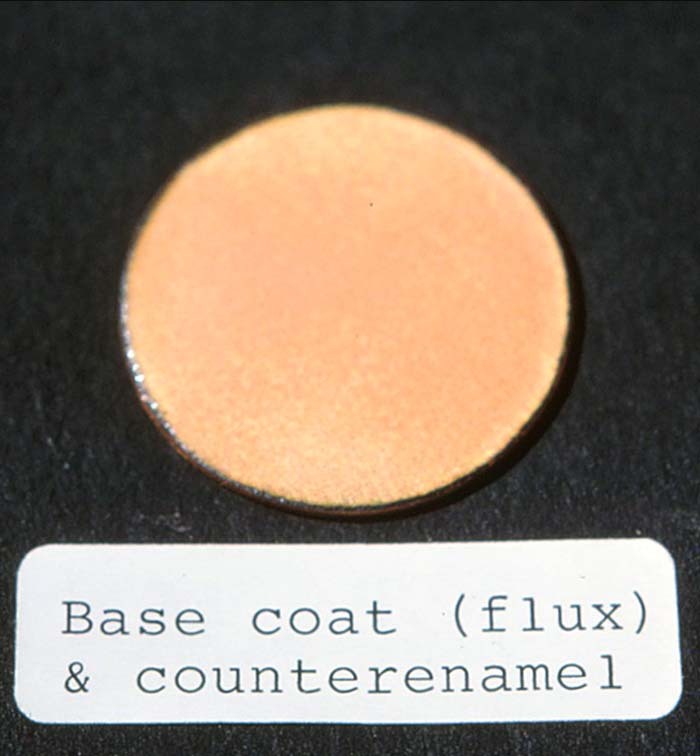 Flux is transparent colorless enamel that provides a base coat, preventing possibly bad interactions between color coats and the raw copper. After the copper is wetted by a liquid adhesive, the flux is sifted onto it from a fine-mesh sieve. 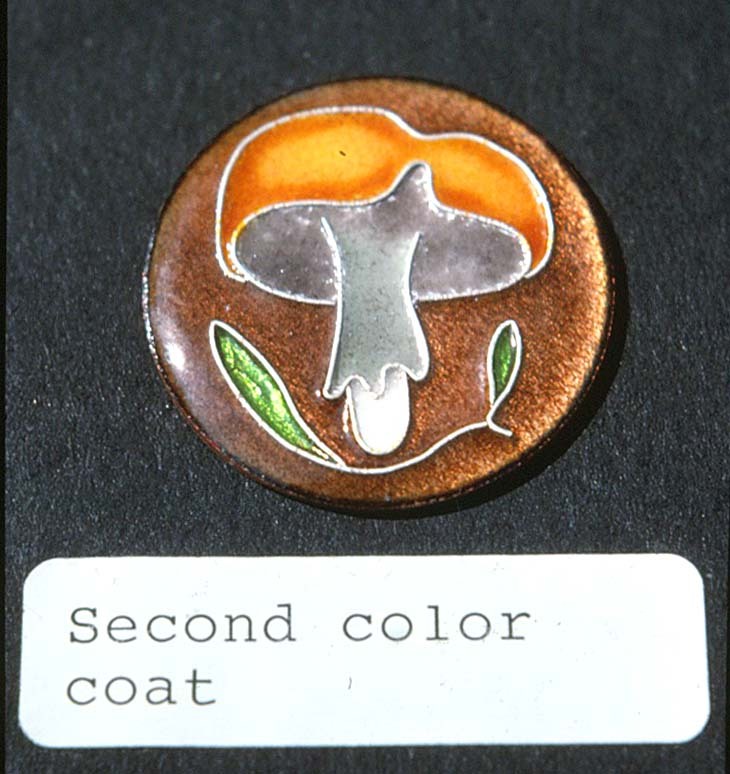 Counterenamel is an enamel coating applied to the backside of the piece. 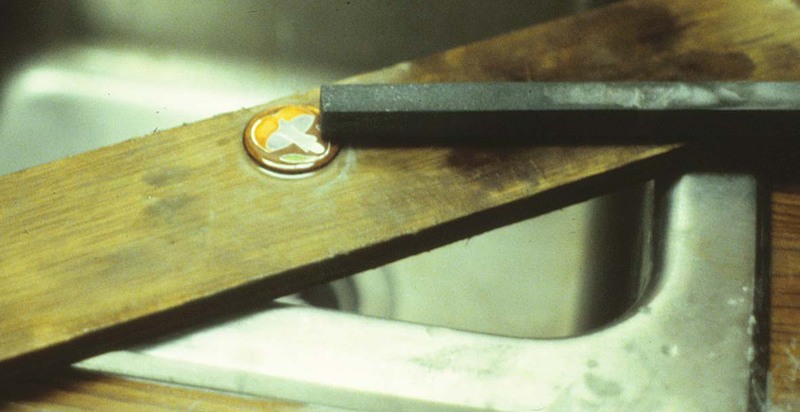 Differences in expansion and contraction between glass and metal set up stresses that could warp the piece and crack the enamel. The counterenamel balances stresses on both sides of the piece. (2) Wires and foil of fine silver. The wires are bent to shape, placed in position, and fired; they are now firmly bonded to the flux. 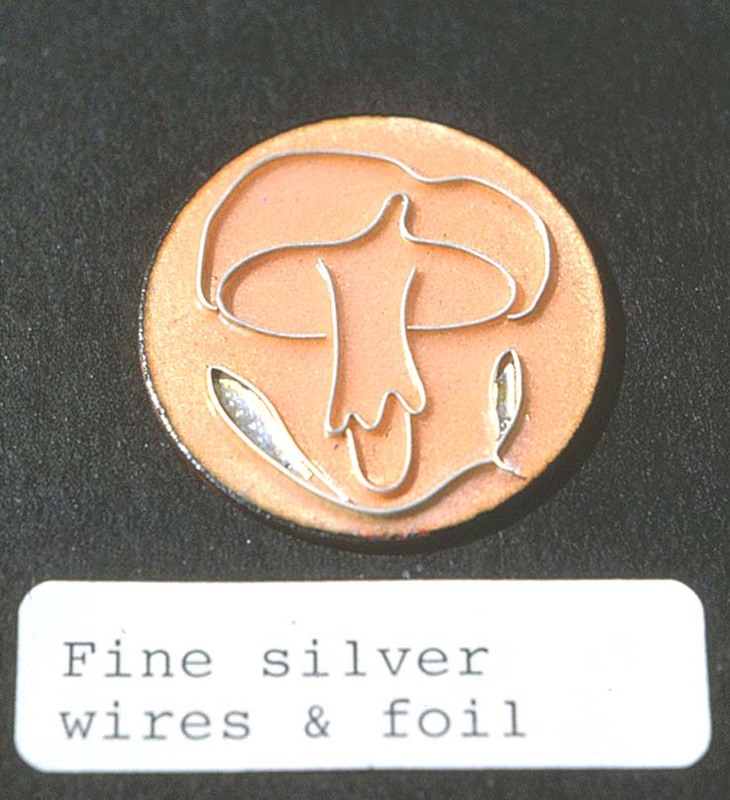 Foil, which produces reflective highlights through transparent enamels, is cut to shape, inserted, and fired. Color coats need to be clear and brilliant. The sifting technique is not adequate because enamel dust and fine particles tend to cloud the final product. Instead, the smaller particles are washed out with water, and the washed enamel is packed in with a small brush while still wet. 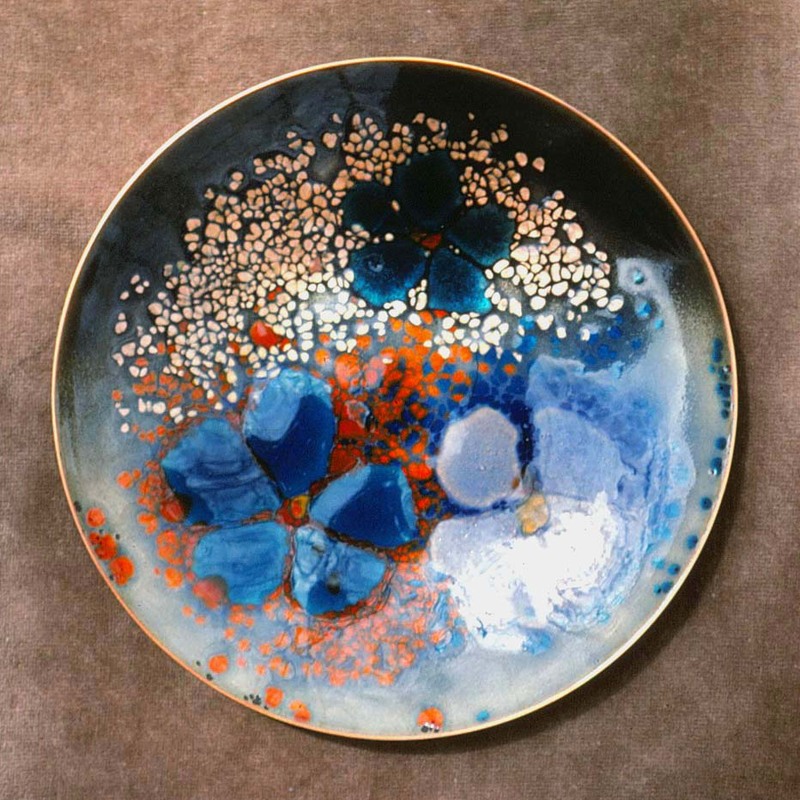 For still greater clarity and brilliance, fresh enamels are made by grinding larger lumps with a mortar and pestle of material harder than glass (e.g., chalcedony). Yes, fine enameling is a labor-intensive process. When packing is complete, the piece is thoroughly dried, then fired. (5) Third color coast, stoned and refired. …and likewise the third color coat, after which the surface of the piece is ground to a smooth flat or gently curved shape, using wet abrasive stones from coarse to fine. After the grinding, the piece is fired once more (or buffed with a fine polishing compound) to restore its gloss. The piece is then ready for mounting. In 1984, after about one year of studies at Glen Echo, I joined the Enamelists Gallery at the Torpedo Factory Art Center. As one of eighteen working members, I learned much from colleagues and from the opportunity to display my work. I served for two years as president of the gallery. After four years at the Enamelists Gallery, my progress in the art slowed notably. 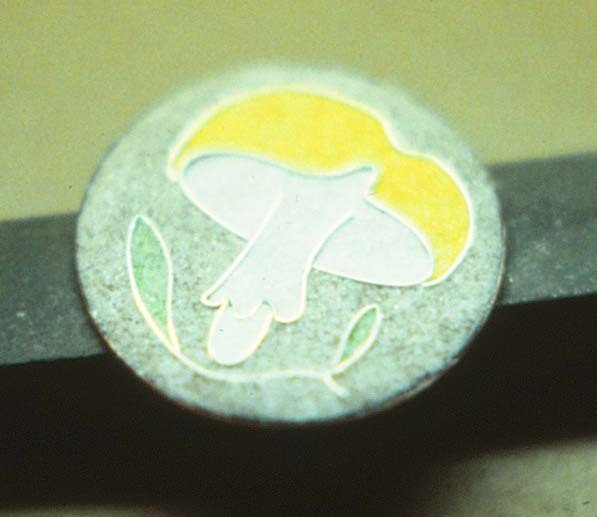 Major advances were taking place at that time in enameling designs and techniques, as well as changes in the enamels themselves to eliminate their content of lead. I saw increasing need to take part in advanced workshops, and perhaps also intensive coursework at a full-time school of arts and crafts. My wife’s worsening health problems, described in part II of this series, Healing Fragrance, precluded further training and diverted more and more time from even the routine artistic work. Near the end of 1988, we found it advisable to move from the Washington area to Charlottesville, Virginia, and thus ended a brief “career” in enameling. This entry was posted in Art and tagged Dorothea Stover, Enamelists Gallery, Glen Echo, Gwen Anderson, National Enamelist Guild, Orsini, Susan Tamulevich, Tina Chisena, Torpedo Factory Art Center. Bookmark the permalink.